The next meeting of the Decide to Be Kind Community Committee is Wednesday, April 24th at 7 pm at Ellington Youth Services. Please email Debbie Stauffer at dstauffer@ellington-ct.gov if you are interested in attending. Register: At Ellington Youth Services, 31 Arbor way or on Activenet. For more information visit the Youth Services website at youth.ellington-ct.gov. Children with special needs and their parents are invited to spend an afternoon creating art. Come meet new friends and learn new skills through a variety of Art Media stations. Refreshments will be provided. 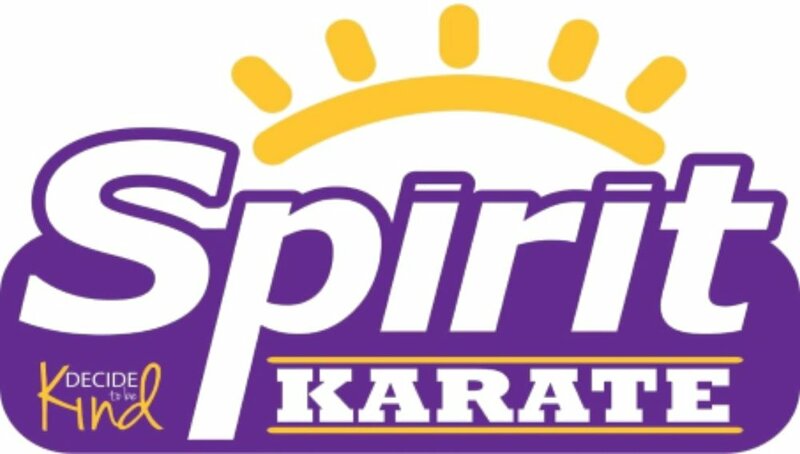 Children with special needs and their parents are invited to spend an afternoon learning Karate in an environment that is safe and fun. Come meet new friends and learn new skills. This clinic will be held at and hosted by American Karate. Children with special needs and their parents are invited to spend an afternoon learning jazz, hip hop, and basic tumbling skills. Come have refreshments and make new friends. Area dance and tumbling instructors will be on staff for this fun afternoon. The next meeting of the Decide to be kind community committee will be Wednesday, October 17th at 7:30 pm at Ellington Youth services at 31 arbor way. for information contact youth services at 860-870-3130 or email dstauffer@ellington-ct.gov. Children with special needs and their parents are invited to spend an afternoon playing fun lacrosse activities, learn skills, have snacks and make new friends. Each child will receive a T-shirt. Code: SPIRIT.LAX18 or in person at Youth Services at 31 Arbor Way. FREE! Join us as we make small hearts from felt and yarn. Each heart will have a tag with a message of hope attached to it. 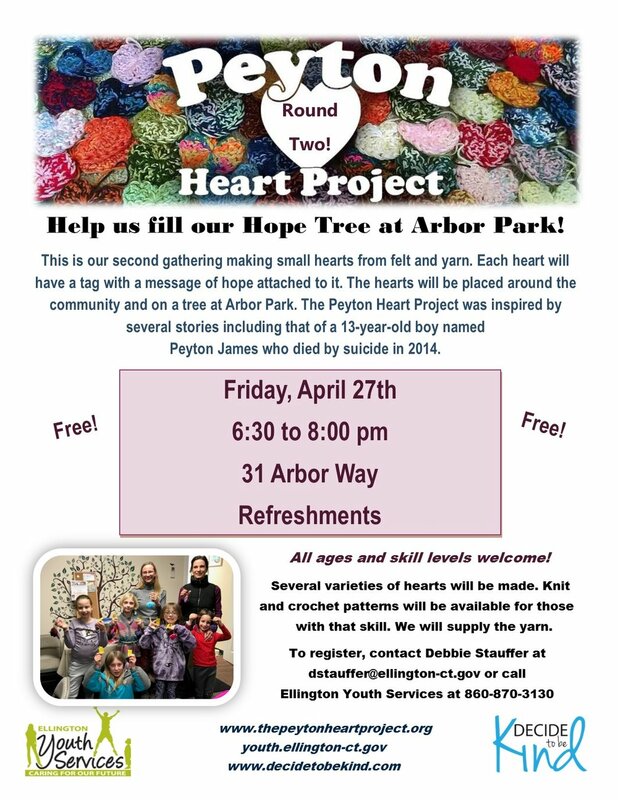 The hearts will be placed around the community and on a tree at Arbor Park. Visit www.thepeytonheartproject.org to learn more. Refreshments will be served. To register, email Debbie Stauffer at dstauffer@ellington-ct.gov or call Youth Services at 860-870-3130. 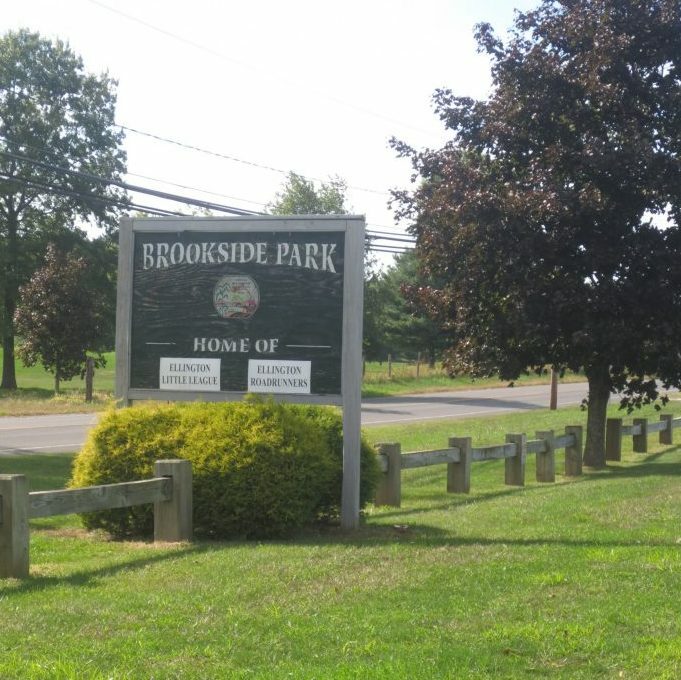 Join the Decide to be Kind Committee on Saturday, March 24th to pick up litter around Brookside Park on Route 140 as we get ready for the spring sports season. Two-hour shifts are suggested, however, if anyone would like to volunteer the entire four hours that is great! We will supply the garbage bags, gloves, waters and snacks. Please let us know if you can help. Children must be accompanied by an adult. Email dstauffer@ellington-ct.gov or call Ellington Youth Services at 860-870-3130 to volunteer. We are all affected by anxiety. Please join us to start the conversation on what we can do to control anxiety in our children and ourselves. Children with special needs and their parents are invited to spend an afternoon learning karate in an environment that is safe and fun. There is no charge. Every participant receives a free t-shirt. Snacks are included. 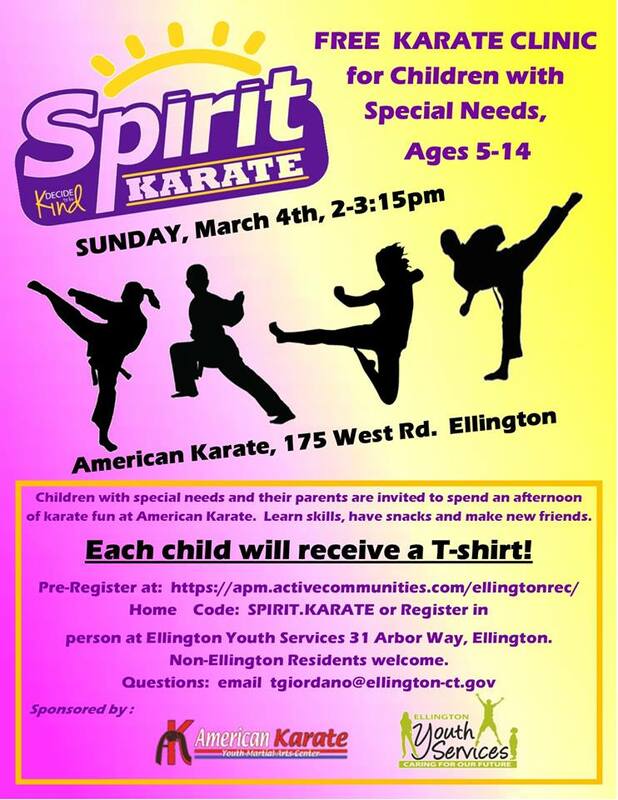 This will be held at American Karate at 175 West Road in Ellington. Visit youth.ellington-ct.gov. Register on Activenet. Children with special needs and their parents are invited to spend an afternoon learning to dance ballet, jazz, and hip hop by area dance instructors. Non-residents are welcome. There will be special guests and a t-shirt provided for each participant. The next Community Meeting is Monday, October 23, 2017 at 7:15 pm at Ellington Youth Services at 31 Arbor Way. Contact Deb Stauffer for details at dstauffer@ellington-ct.gov. Join us and create a wind chime that can be hung on a tree for others to enjoy or keep. Pass on the sounds of kindness! The Wind Chime workshop will take place on May 16th from 6-7 pm or June 2nd from 5-6:30 pm at Ellington Youth Services at 31 Arbor Way. To register, please visit Youth Services or go on Activenet. The cost is $10 per session. Children with special needs and their parents are invited to spend an afternoon playing fun lacrosse activities, learn skills, have snacks and make new friends. Area high school and college level coaches will be on staff. Each child will receive a T-shirt! Join us for our next meeting to plan events for the year. Many ideas are on the table. Join us for our first fall community meeting to discuss ways to come together to encourage kindness in our community. Congratulations to our winner Ryan! Enter in your appropriate grade category: K-2, 3-5, 6-8, and 9-12. Please mark clearly your name and grade on the back of your drawing and supply a parent’s email address and phone number with drawing. Use your choice of crayons, colored pencils or markers. Use standard 12”X 18” poster size paper. Paper is available at Youth Services at 31 Arbor Way. Show an act of kindness or present ways to be kind through pictures and words. Be creative! Send or drop off posters to Ellington Youth Services at 31 Arbor Way. Deadline is 4 pm on April 20, 2016. One winner in each category will be chosen at the end of April. Winners will be announced and exhibited at our Decide To Be Kind booth at the Ellington Farmer’s Market on Saturday, May 7th. All participants are invited to have their photo taken with the Kindness Cow! A real cow! Each winner will receive a gift card. Questions? Contact Youth Services at youth@ellington-ct.gov or call 860-870-3130. Be kind to our environment! Join us on Saturday, April 23rd to celebrate Earth Day (April 22nd) and clean up our community. We will meet at Brookside Park Pavilion at 10 am and teams will either pick up litter at Brookside or drive to an elderly resident's house to pick up sticks and do light raking. We will meet back at noon at the Pavilion for lunch provided by local businesses. Glove and bags will be provided. Bring a rake if you have one. A volunteer with a truck to transport sticks to brush dump is needed. Contact Youth Services at 860-870-3130 or email dstauffer@ellington-ct.gov to volunteer. arbor park from 9 am to noon. GET A "JOIN THE MOO-VEMENT" SIGN WHILE THEY LAST. HAVE YOUR PHOTO TAKEN WITH OUR KINDNESS COW! A REAL COW! "Around the World in One Knight." visit http://library.ellington-ct.gov/ for details or call 860-870-3160. A traditional Indian celebration that announces the passing of winter and the coming of spring. This is an outdoor event (rain date is June 11th). There will be music, dance, food and colored powders. The activities are free but preregistration is required.